Okay, maybe not the purpose exactly, but endeavors should be undertaken for which failure is a high likelihood. If we live every day sure that what we do that day will succeed, we are doomed to mediocrity. Growth will be a distant memory at best. True growth happens on the far fringe of comfort where fear and embarrassment live, not in the soft, warm center where we are wrapped the comfort of our present strengths. My husband and I had some work to do out west last fall, so we made an adventure of it, driving the nearly 2,000 miles over a couple of weeks, stopping at places of interest along the way. Arches National Park was one of the places. We had been there before, but with his mom and step-dad, so long hikes were out of the question. This time, though, we were free to explore at will. The hunny and I are both a bit afraid of heights. 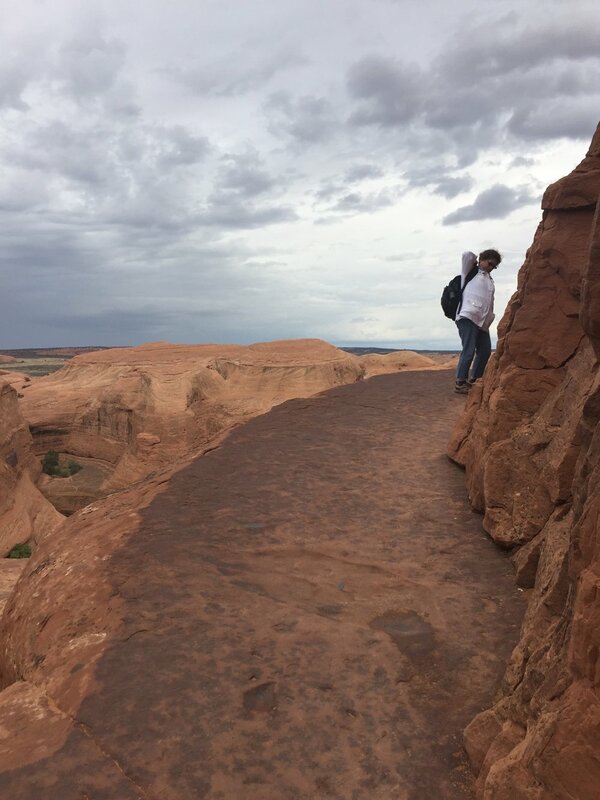 If you have ever explored southern Utah, you know it’s not the most friendly of places for acrophobes like us. Some of the hikes in the park are along flat areas, though, and we made the most of those comfortable adventures. But the magic? The magic happened when we chose to push our limits a bit on a more challenging hike with the chance that we might chicken out along the way. The terrain was stunning, but there were areas where we had to simply look where our feet were going and put one in front of the other, pointedly ignoring what felt like a plunge to our death on our right. In truth it was a gently sloping rock face that led off to a few hundred feet of drop off. I’m sure it was perfectly safe beyond the heart attack it threatened to give us. 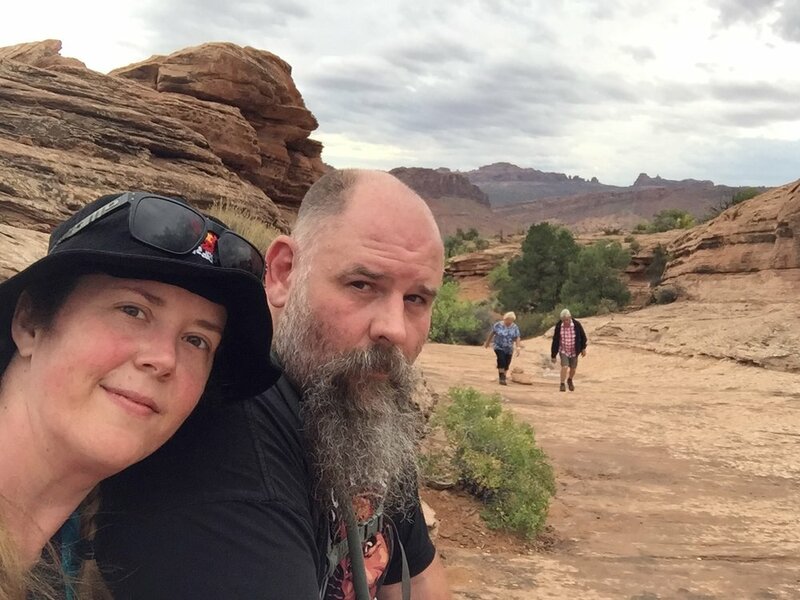 We were able to laugh at ourselves afterward, though, and it desensitized us a little to the effect, thus broadening our horizons for later hikes. I’d like to be able to tell you we both finished the hike and patted ourselves on the back for braving the danger. The last 100 yards or so, though, were a bit sketchy. That’s the picture you see at the top of his post. As we approached it, we were uncertain exactly how much further we had to go, so since my fear of heights is a bit less debilitating than my husbands, I volunteered to trudge ahead and see just how far we had left and what that bit held in store for us. To see if it was worth his risking supraventricular tachycardia to see this “Delicate Arch” that is rumored to be so amazing. As I look at the photo now, all I can think is that there’s no way in hell it does it justice. My heart races just thinking about it. That rock ledge that was the trail seemed about six inches wide and the drop off to the left felt like a sucking chasm pulling, pulling, pulling me into its grasp. So I put my shoulder to the rock and inched along keeping close contact to what I hoped would be the gravitational pull of the wall to my right. As I approached that curve you see in the photo, a little Chinese lady came bouncing around it from the other direction. “You almost there!” she said. Then she paused and took a good look at me. “Oh, you afraid? It okay, trail plenty wide here,” she said, taking a step toward the outside of the trail and gesturing with a wide sweep of her arm at all that room on the slender edge of the world. I nodded, thanking her and prayed no one else would come along. I’m a broad woman, and I was sure anyone larger than that teeny little Asian woman would knock me off balance and seen me careening into the abyss. One step. Then another. Always maintaining contact with the right shoulder to the wall. Deep breath. Look straight ahead. Round the corner…And there it is. The arch was beautiful as was the view around it, but I don’t remember it as well as I remember the rock slope leading down to it and all of the people wandering around, obviously having lost their minds. While I had to sit my rear down on a stone ledge in order to turn my head any significant amount in any direction, they were practically turning cartwheels, taunting gravity. Seriously, I have no idea why more people don’t plunge to their deaths every year in southern Utah. My view from where my rear was glued to the rock. Having completed my mission, I inched my way back to my hunny, showed him the photos, and told him he’d seen the best parts of the hike anyway. We’d both done enough growing for one day. I think a little part of him marks that down as a failure, not having gone that last little bit and seen the arch for himself. I, personally, don’t feel it was because we both pushed our limits and even went a little beyond them in a few ways. Plus we came away with some great memories, a couple of even better stories, and a bit more confidence in our abilities to push ahead in the face of discomfort. We never would have gotten exactly that on the flat trails down below, and I would have one less tale to tell. Having defied death at the beginning of the trail.